Good day muffins. How are we? Let’s talk. I’m thinking about sweets. Chocolate. I’m thinking about whoopee pies. I’m thinking let’s put espresso in a cookie…and then let’s also put it in the schmooey sandwiched between the two cookies. Let’s turn a kid cookie into a grown-up cookie. Cause we’re mature like that. Actually, a “grown-up cookie” doesn’t sound nearly as exciting as these cookies are. Let’s call them jacked-up cookies. I like that. Normally I would make my food adult-like by adding booze to whatever I’m trying to transform. Today, I’m using coffee. Not just coffee, but espresso. I know…we’re going big. Before you panic because you don’t have an espresso machine, just pump the breaks there Nelly. You can use some strong-brewed fresh coffee as well. We’re flexible here. Let’s work together. We’re a team. My son has been beggginnggggg me for weeks to make whoopee pies. Like nagging. Which should be super annoying but there is NOTHING I LOVE MORE THAN SPECIAL REQUESTS. The way to my heart is to say: Ohmygod, I love those cookies that you made in December…make them for me!! Next thing you know I’m in your lap licking your face. So happy. Thank you. A couple of quick notes before we get started… First, these are just a flipping great double chocolate cookie. As is. If you don’t feel like making schmooey today, that’s fine. No pressure. Just make these cookies. They’re happy soft cookies. That sounds like a cookie I’d buy in Asia… Regardless, these are firm enough to be a whoopee pie base; soft enough to offer zero resistance when you bite into them. I like a soft cookie. It’s important to me. Second, you don’t have to go for the espresso buttercream…it could just be missionary vanilla buttercream for you (no judgement). I made that for my kids and they loved it. I have some notes down below on how to make that happen. Lastly, I don’t know how you feel about this, but you could use decaf espresso if you’re caffeine sensitive (I’m feeling sensitive just bringing this up). Decaf espresso sounds like an oxymoron, but when I’m baking with coffee I sometimes use it. I, as well, am a delicate flower. I used an electric stand mixer (fitted with the paddle attachment) to make these…however, you don’t have to if you don’t have one…just use your guns. But the butter and both sugars in your mixer and blend until light, fluffy and creamy. Have your speed on medium-low. Add the eggs one at a time, making sure each one is completely incorporated before adding the next. Make sure you scrape down the sides as you go. Meanwhile, mix your dry ingredients: cocoa powder through salt. Fluff around with a whisk or a fork until everything looks nicely blended. Smell it. Yum. Pour your dry ingredients into the butter mixture and mix on low until everything is almost blended, but not quite. Pour in your chocolate chips and then gently give it the last few mixes with a wooden spoon and your strong arms. You’re looking good. Have you been working out? Now put some plastic wrap or foil over the top of your mixing bowl and put it in the refrigerator for about 30 minutes. You don’t have to do this…but this dough is a little sticky and it will make it easier to deal with. Plus, I like what happens to dough if it gets a slight chill to it before you pop it in the oven. A nice rise, if you know what I’m saying. Put the 1/2 cup sugar in a bowl. Roll about 1 1/2 tablespoons of cookie dough between your hands to make a nice ball. Don’t press into it or pack the dough together. We’re just shaping it a bit. Roll aggressively in the sugar and put on a cookie sheet…you want them nice and coated. You can fit 12 of these dough balls on a cookie sheet. They shouldn’t run into each other. One quick tip when rolling: make sure they are pretty equal in size and pretty spherical. We’re going to have to pair them up to make the whoopee pie sandwich. Also, your hands are going to get messy here. I hope you can handle this. Bake for 13 minutes. They will look a hair undone. Let them cool on the cookie sheet for 5 minutes and then finish cooling on a rack. Put the butter, shortening and cream cheese (my holy trinity) in your stand mixer fitted with the paddle attachment. Beat together until nice and smooth. Add your espresso and beat some more. Pour in your powdered sugar and beat again until fully combined and velvety looking. You want this frosting spreadable, but not oozing. If it seems like it needs to firm up a bit, add more powdered sugar in 1 tablespoon increments until you get the right consistency. If you’re feeling it, add the granulated coffee and do a quick mix. Boom. You’re done. *IF* you don’t want the espresso buttercream, simply omit all of the espresso/coffee elements and add in 1/2 tablespoon vanilla extract. You’re going to use less powdered sugar if you’re making the vanilla buttercream. So start with two cups of powdered sugar and then check your consistency. Is it firm enough to hold two cookies together and not drip down the sides? If not, add more powdered sugar in 1 tablespoon increments until you get there. I put the frosting in a big zip lock bag (pack it in there) and then I cut a bit of the bottom corner off (about 1 centimeter). Then I piped the frosting onto the cookies. I stayed a little bit away from the edge of the cookie so that when I pressed the two cookies together it didn’t ooze all over the place. How do they look? How do they taste? Are you happy? Welcome. My daughter, Stella, is the one that wanted the five e’s in Whoopeeeee…I think she’s pretty funny. I wanted to give her credit. I bought two cookbooks in the past week. The first was the Saveur New Classics. I made the Swedish meatballs. Delicious. It has a condiment section. Why doesn’t every cookbook have a condiment section? I also bought Plenty More. I have been flirting with buying this for MONTHS. I mean, months. A vegetarian cookbook makes me slightly nervous. It’s like going to an astro-physicist gathering…I’m a little out of my element. A little…that’s funny. But @rainydaybites (Instagram) is using Plenty More for her cookbook club this month so I’m taking it for a test drive. If you don’t follow her now, you should. Her feed is gorgeous. I was totally flummoxed on the whole whoopee pie vs Oreo thing. What is the difference??!?!? Of course I didn’t research this until I had finished the recipe, including testing, photographs, the whole shebang. 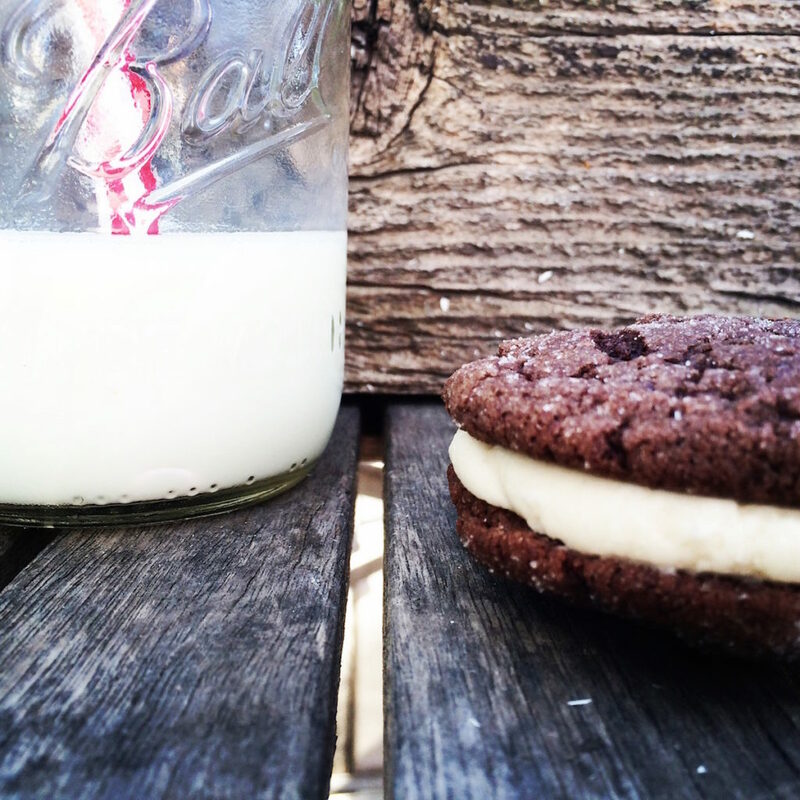 The recipe above is what a whoopee pie is to me. But, apparently whoopee pies are traditionally made from cake batter? What?? Did you know this? And why is it called a pie? I have made homemade Oreo’s before and there are some differences in my two recipes…but what about the rest of the world and does anyone care? So, here’s what I know. There are whoopee pie recipes out there that use cake batter and there are some that use a cookie batter. I took the latter route. I can’t spend another second of my life worrying about the details. Here’s also what I know: it’s chocolate. It tastes great. Just eat it. How is it already February? What plans do we have? Valentine’s Day. Love it? Hate it? I know I like to bake for it…jury’s out on the rest. My trip to LA is coming closer. Yeah. I need this. Thanks for emailing me some recommendations. P.S. My sweet tooth is outta control!! all the sweets…. 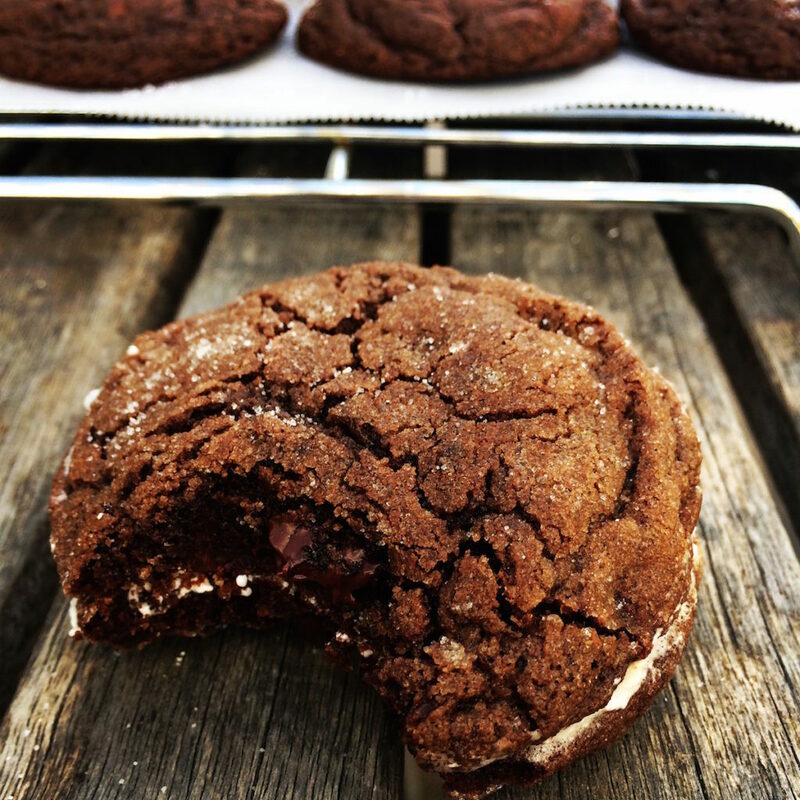 i’ve never made whoopie pies, but now i think i might have too. and i love the sugary sparkle! Yum! Love this post, love this recipe, (love you!) Haha. Your sense of humor and wit are such a killer combo, but then you cook, write, AND take amazing photos?? You are a force to be reckoned with. So glad I found you!